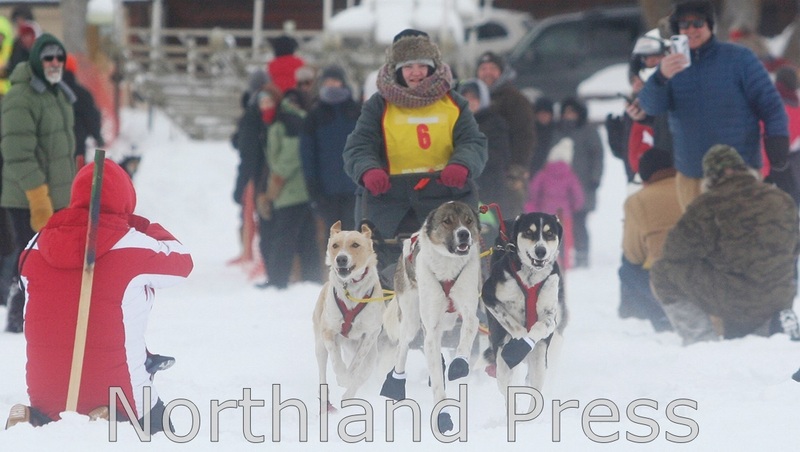 The 31st annual Mid MN 150 self dog races were held Saturday, February 9th. The annual race features mushers and their 6- and 8- dog teams participating in a 30 mile race to Remer. The race began in Outing on Lawrence Lake and the mushers traveled along state and county trails, roads, lakes, and finally, the Soo Line Trail before finishing in Remer. Volunteers from the Brainerd Area Amateur Radio Club (Ham radio operators) monitored the course and communicated where each team was located on the trail. 1 - Sherri Moe, Grand Marais, MN, 2:57:34; 2 - Darcy Stanley- Nord, Milaca, MN, 3:12:12; 3 - Shara Norris, Two Harbors, MN, 3:14:47; 4 - Nick Turman, Two Harbors, MN; 3:16:03; 5 - Scott Edget, Babbitt, MN, 3:16:07; 6 - Steve Goedken, Deerwood, MN, 3:36:46; 7 - Logan Johnson, Glyndon, MN, 3:43:55; 8 - Neal Seeger, Detroit Lakes, MN, 3:46:24; 9 - Kenedi Wrezzes, Amery, WI, 4:11:33. 1 - Frank Moe, Hoveland, MN, 2:42:10; 2 - Andre Duval, Brainerd, MN, 2:54:46; 3 - Robin Fishers, Cook, MN, 3:07:20; 4 - Bob Fisher, Togo, MN, 3:09:10; 5 - Linus Meyer, Melrose, MN, 3:17:55. It was the first ever race for Werezzes, Goedken, Norris and Johnson, who was the youngest competitor at 15 years of age. The race is traditionally held the second Saturday in February and is tentatively scheduled for Saturday, February 8, 2020, weather and condiitions permitting.